YEA, today is officially the first day of Spring! Micah Claire is loving the new warm temperatures and the long hours of daylight. Some nights it's a battle to even get her to come in and eat dinner. 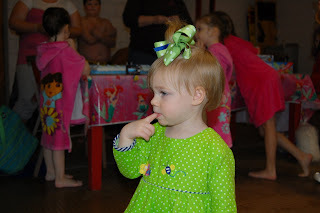 I think this picture screams.........Deep thoughts by Micah Claire Here's my sweetie showing off just a little for the camera. 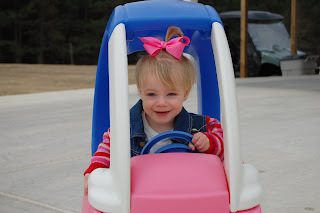 I think this is one of my favorite pictures of Micah Claire. It's just priceless! 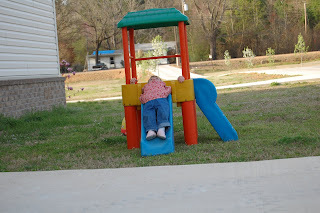 It's no longer fun to just slide the normal way. Now we have to do a stretched out version. 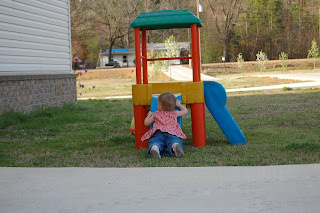 A few weeks ago, at the park, she saw a kid go down the slide on his belly. Of course she picked right up on it and now does it all time. Bruce had to check out M.C. 's new bubble wand. 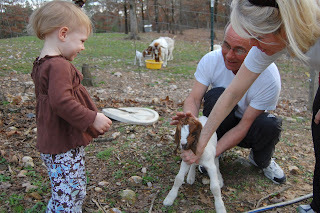 Nana and Poppa have 2 new baby goats (and they are expecting many more in the next few weeks). It took M.C. 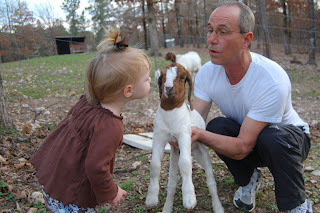 a minute or two to warm up to this baby goat. 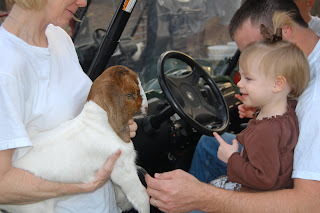 Here she is still thinking about whether or not she wants to befriend this baby goat. Nana steps in to help ease M.C. 's fears. And finally she decides he's not so bad and decides to plant a big smooch on him; tooo cute! 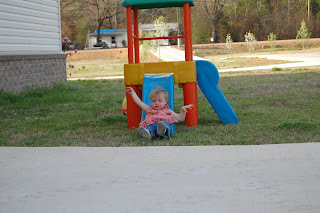 Before my child could even crawl she was climbing on everything. And as you can see from this video, she's never really stopped. 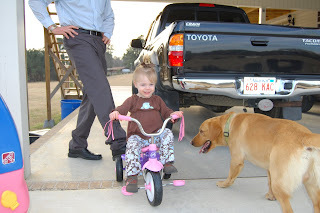 Her Daddy was not happy about this new stunt at all; I know it's dangerous but I still find it hilarious. I just had to get it on video. BYE BYE FLU; HELLO TRICYCLE!!!!!! 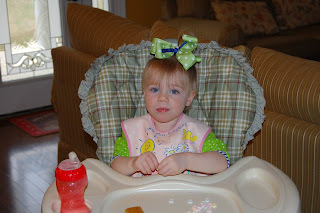 On Friday morning (after 5 very long days) Micah Claire's high fever finally broke! So on Friday she finally got to get out side and enjoy the super nice weather we were having. 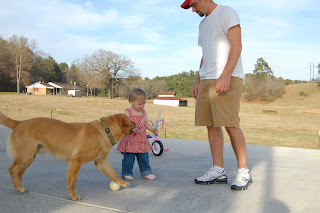 Little did she know the surprise her daddy had in store for her. I told Shawn about 2 weeks a how much M.C. 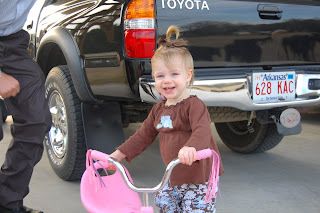 enjoyed playing on Kaylee's tricycle. Ever since then he has been determined to find just the right one for her, and he finally did. 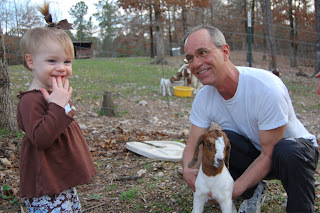 When he got home from work last Friday he pulled it out of the back of his truck to surprise M.C. 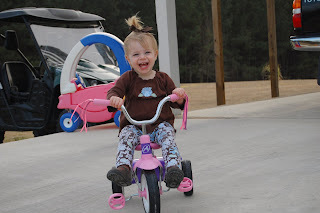 She was soooo excited to see her brand new pink and purple tricycle. 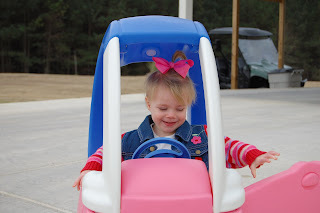 It was love at first site when Micah Claire saw her shiny new tricycle! 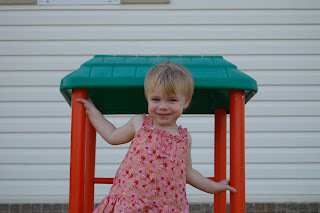 Check out that big cheesy grin on my girl's face; truly priceless! Even Bruce had to come check out M.C's new set of wheels. 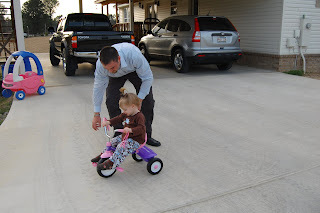 Here is Daddy trying to give her a few instructions on how to properly operate her new tricycle. 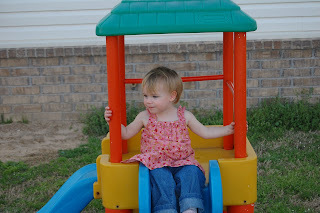 What a pro; she knew exactly where to put her feet and how to make it go. 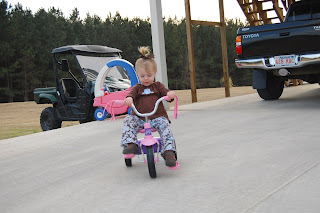 And it didn't take her very long to discover that if she went down the drive way she didn't even have to pedal at all.....weeeeeeeeee! Today Micah Claire turns 18 months old. 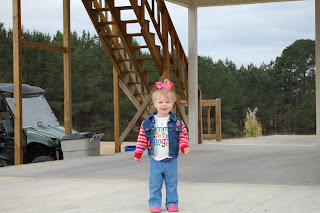 She is no longer just a 1 year old; she's a big 1 1/2year old. WOW; where or where has the time gone. She was dying to go outside this morning. So, I finally gave in and let you play for a few minutes. 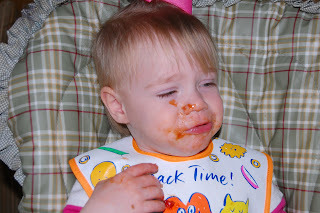 Monday afternoon our babysitter called and said Micah Claire had a fever of 102-103. So Shawn went and picked her up and gave her some medicine. Every couple of hours her fever would go sky high again. 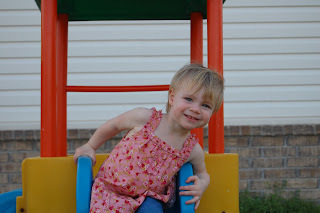 It got super close to 105 which scared the mess out of us; but she had no other symptoms (weird I thought). My mom stayed home with M.C on Tuesday. A little before lunch she called and said she couldn't get M.C's fever to stay down and she wouldn't eat or drink anything. So I called the doctor and they got us right in. 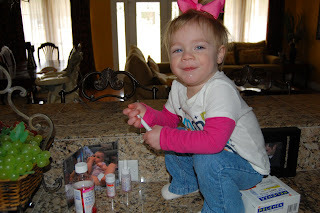 Dr. Perrin thought it might just be the start of a bug but she went ahead and did a strep test and a flu test. She said it will take about 15 minutes to get the results. Well.... within 15 seconds she came back in the room and said the flu test had already produced a positive result. My first thought was NO WAY! But after she showed me the result stick I knew it wasn't a joke. And of course M.C. is too young to take medicine recommended for children with the flu. So..... we just have to wait it out. Dr. Perrin said M.C. is only the 4th case this season and all the cases have been mild-no body has had to been hospitalized because of it. So I hope and pray that she recovers quickly and as easily as possible. She gave Shawn and I some medicine to start pre-treating us just in case was start to develop it. She recommended that I stay home since I work around pregnant women and newborns. Micah Claire has to fever and symptom free for at least 48 hours before she can be considered non-contagious. So, it looks like M.C and I will be home together for the rest of the week. She has had numerous baths to help get her temp down. Thank goodness she has no problems taken medicine! Some how she even got the child proof lid of the Tylenol and poured an entire bottle on my carpet-YIKES! 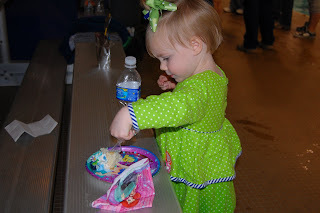 Saturday afternoon Micah Claire and I went to Lainee and Gracee's 4th day party at the HSU swimming pool. 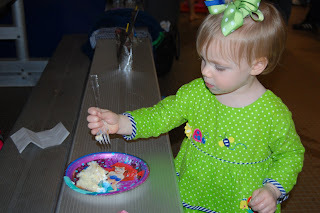 Micah Claire had a great time at the party. 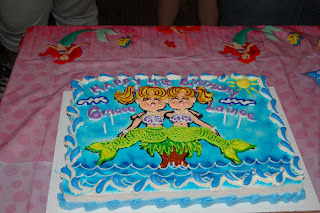 Check out their super cute mermaid cake. 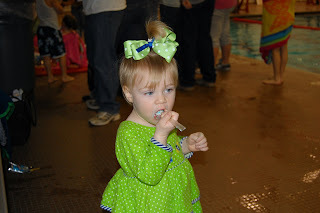 M.C was more interested in getting back in the pool than singing Happy Birthday to the girls. Walking and eating... that's my little multi-tasker. Ms. Traci sent M.C home with a goody bag that had Smarties in them. 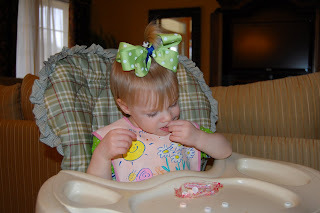 This was her 1st time to eat them. At first she didn't' like them because they were so hard. But then she realized how good they were once she bite into them. She ate all 2 packages of them. I took and posted these pictures just so Ms. Traci would have proof that I actually did let M.C. eat them! After the party we went to help our friends move into their new apartment. Shawn helped load and move all the furniture while I watched all the girls. 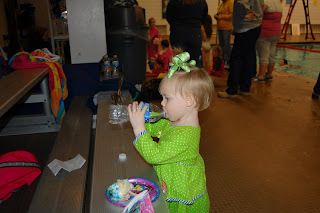 Before I new it, it was 6:30pm and I had to get my child feed. The other adults were busy moving and unpacking so I took M.C. and Kelsey to Pizza Hut. M.C. 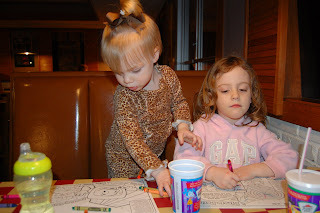 and Kelsey coloring me some beautiful pictures. 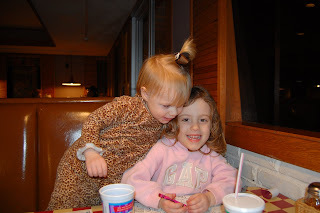 Micah Claire loved being with Kelsey. She just kept hugging on her; too cute! Not really sure what's going on here. 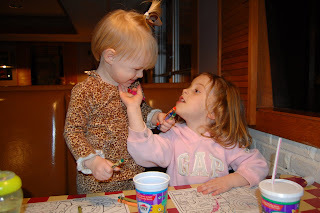 Looks like Kelsey is giving M.C. a little advice. It got too dark and too cold to get all their stuff moved; so all 3 Davis girls spent Saturday night with us. M.C had a blast bathing and playing with Kelsey til 10:30pm.